True personal attention combined with solid legal representation has been the hallmark of Kurt Schnelz’s law practice for over 33 years. Kurt is involved in every aspect of a client’s representation, from the initial meeting until the case is fully resolved. Kurt’s dedication to providing personal service means that he works with his clients to develop realistic goals backed by expert legal advice. He focuses on moving a case forward timely and effectively, while ensuring his client’s rights and concerns are protected through strong solid legal advocacy. Kurt is highly respected by both judges and fellow attorneys for his professionalism and his knowledge and skill in representing clients’ interests. 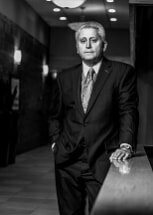 He is recognized as a leading trial attorney in the field of domestic relations law throughout Michigan and is a Fellow of the American Academy of Matrimonial Lawyers and Past President of the Michigan Chapter. Kurt’s focus on personal involvement, in every part of a case, means that he provides skilled legal representation that is tailored to the needs of each individual client. Kurt has dedicated his practice to ensuring that each person he represents is protected through expert legal representation, compassion, sound advice, and hard work.